I am posting a picture of some of my herbs to enter into Squirrel Queen's Farmer's Market Challenge this weekend. 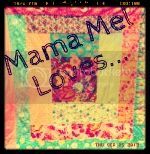 Check her site out and enter your photos of your local Farmer's Market or your backyard garden. I am growing some tomatoes and bell peppers in my backyard planter too and I was hoping to have some of them in this pic too, but they weren't quite ready yet. However, my herbs are growing like crazy! I have a bunch of basil, sage, rosemary and thyme, and I love using them in my cooking. The best part is, I can just walk outside, snip some fresh herbs, rinse them, then start chopping! I just LOVE the smell of fresh herbs! Ok, I need to know...where did you get that adorable mini shopping cart?? I have to have one! That is just adorable. Thanks for sharing! Your herbs look beautiful! I can't seem to get mine to grow quite that big...possibly because I leave town sometimes and they don't get watered for a few days? I love your blog. I can't wait to make my first sock animal. Your herbs are beautiful, much better looking than the ones I try to grow. That little shopping cart is so cute. I think I will take a look at the one on Amazon, thanks for the link. Thank you for taking part in the challenge, this is so much fun. This is great! my husband planted a salsa garden with tomatoes, hot peppers, sweet peppers and cilantro. We are getting tomatoes and hot peppers but still waiting on the sweet peppers. I totally want to plant an herb garden. Thanks for the inspiration! 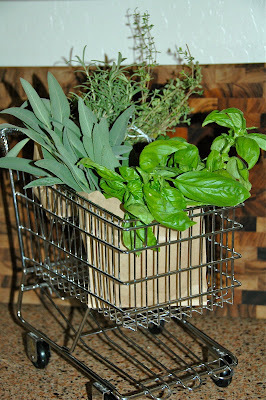 Yes, those herbs look awesome, especially in that mini shopping cart. I love fresh herbs; they can make any plain old dish into something spectacular. I've just started growing herbs. I planted some chives in a small flower garden. Yum! I plan on expanding the selection next spring. It is wonderful to step outside for fresh herbs. You have a great selection. I have parsley, sage, mint, and rosemary in my garden, and I agree - there's nothing better than fresh herbs for cooking.